My mom is an excellent seamstress. She made all kinds of clothes for us when we were young, has made many a curtain, is now into making bibs and high chair pads for miss Emily and still makes herself clothes on occasion. She taught both of her daughters to sew. #2 daughter seems to have really caught the bug and makes all kinds of fun things. #1 daughter (that's me) struggles to do anything more complex than straight seams. I can do the very basic steps, but I just don't enjoy it all that much. I have started making burp cloths for friends when they are expecting, but really don't have any desire to do much more. A couple of weekends ago, Heather and Emily came in for a visit. We decided since they were coming without Phillip and could bring his pickup, and my parents were going to be here the very next week, that it was time for Emily's big girl bed to find a home with them. In the past few months she has climbed out of bed a few times, so this way, when they are ready for her to graduate from the crib, she can just put the bed together and be done. This trundle bed was my first out of the crib and was Heather's bed all through growing up. It moved to Dallas with me as my guest sleeping in my apartment and has lived in my office as secondary guest sleeping in my house. When I first moved to Dallas, mom made me a valance that matched a t-shirt quilt I had made. I lived with that for a while and then decided to redecorate my guest room/office in my apartment. We got overly ambitious with our plans and I made a tab-top denim valance. All I can remember is my fingers about falling off while I tried to sew the buttons on those tabs through what seemed like 87 layers of fabric. It was cute (still is), but was very challenging for me. When I moved into my house over three years ago, I didn't quite hang the curtain rod high enough and the top of the blinds had been showing through the tab gap. This, of course, was on my never-ending list of things to fix. Never got around to it. Now that my office is no longer a secondary guest room, I decided it was time for a new valance. While Mom was here last week, we went to JoAnn and found some perfect fabric. Then spent probably 45 minutes trying to write out a "pattern" with measurements for me. Today, I took the plunge to cut, piece and sew the valance. Seems like it took way longer than it probably should have - maybe it didn't. But that 3.5 hours felt like forever. I had issues getting the fabric cut straight and even, but in the end, only lost 1" off the length. I call that a success!! I can't easily find photos of the previous curtains, so you'll just have to enjoy the new ones! It's time again! 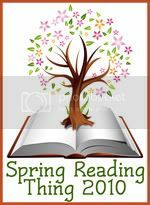 The Spring Reading Thing challenge, hosted by Katrina of Callapidder Days. I don't usually have a *real* list -- I just keep you updated as I go along and make a wrap-up list at the end. Not so this time around. I recently began doing book reviews for Thomas Nelson -- they send me a book, I read it, write a review on my blog and an online retailer and I get to keep the book. It is great fun since I get to choose the books I read and review. This morning was our baby shower for my sweet sweet Kelly. It was so fun and easy to plan, decorate and execute! We went with a "vintage modern" style....polka dots, bright colors, and vintage toys/clothes were the thematic ingredients. Good food, friends and fun baby gifts. A great morning! And, of course, another burp cloth project! Adrian is a rabid Steelers fan, so I thought it would be fun to include a special set of burp cloths just for him to use.